Kim Pritekel is one of the first authors I stumbled across in the lesbian romance genre. Her stories are always well thought out with interesting characters. Going into going into her stories you know you are going to get a slow burn romance and a bit of craziness. Burton Blinde is an investigative reporter for a local Denver new station. When we first meet her she is on her way to being a star, courted by CNN, she slated to be the next Barbara Walters. Days away from her move to New York, Burton is still tracking local stories, one including the juicy gossip of a Colorado senator being blackmailed by his former lover. As Burton is questioning the politician all hell breaks loose and a madman throws a grenade into the car, killing everyone but the reporter. Suffering horrific injuries Burton closes her friends out and retreats to the wilderness to live in near isolation. Years later, after going through some of her old boxes from her reporter days, Burton comes across cryptic postcards. Her inquisitive mind will not let it go so she begins trying to find the old clues as to what the anonymous postcards were trying to clue her in on. Okay so up until this point right here, I am digging this book. A great foundation is been laid out and I’m like oh yeah where we going with this. Then it kind of went haywire. So to make it quick, a small country, Chilvokia, near Russia is under attack, total warfare and has been for years. Dr. Lilli Novikoff, while studying medicine in Denver was the one trying to reach out to Burton to tell her of her country’s strife. First off, just tell her, she’s a reporter they are always looking for a story. Second, maybe contact the UN or NATO, just a thought. I think they would like to know if there has been coup, slaughtering person in the streets. So any who Button goes to Chilvokia, it’s damn war zone, meets back up with Dr. Lilli, saves the king, falls in love…and goes home a hero. I can’t give you more because I was lost in the second half of the book numerous times. I wasn’t always sure who was who, and what was happening. What was the point of the war, I am still not sure, and something about selling women, kids and weapons, maybe. I was swimming in muddy water. It was fun and I enjoyed it but sometimes I had no idea my left from my right if that makes any sense at all. Also, I needed way more time with Burton and Lilli the couple, the romance part of Blinded was lacking. 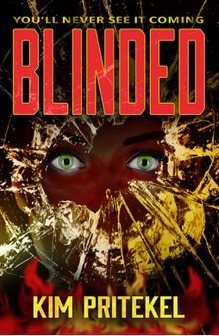 Blinded is good, not great like Pritekel’s other books. I felt like she needed more chapters to explain what was happening. I think if the story had been longer, it could have cleared up the confusing pieces. Her characters definitely had chemistry I just needed more time with them together to solidify a stellar romance.